I apologize for not updating. I was really hoping that there would be some announcement or update coming from Tattoo by now. I called before driving to the location. Laura answered and said they are still working on getting the factory set up. She also asked me not to come by for a visit because they just weren't set up for that. She did say things were moving forward. I do think there will be boats made in the near future. I will be buying one of those first boats. I will update this post if I am contacted with purchasing instructions before an official announcement is made. I will continue to sail my until the is ready. I don't think this is all some big conspiracy perpetrated by Tattoo sailboats to trick us all. I am disappointed that the date given for production moving forward was missed, but I am sure it is probably complicated to get everything set up properly. For those who are interested, you have supplied the most up to date information yet. It may not be what you wanted to hear, or what those interested in a want to read, but it is something. This might yet come to fruition. miamistyle wrote: I apologize for not updating. I was really hoping that there would be some announcement or update coming from Tattoo by now. miamistyle wrote: I called before driving to the location. Laura answered and said they are still working on getting the factory set up. She also asked me not to come by for a visit because they just weren't set up for that. I translate this to mean you reached her cell phone and they have no factory. Losing hope this will ever happen now as more time goes by. I'm losing hope. Still waiting for an address to send my standing PO. A larger Macgregor, something in the 28' range has long been talked about among enthusiasts, but no plans have ever been made by Macgregor or Tattoo to take the jump up in size. We got an interesting brochure some months back for the Imexus 28. Price point is the barrier, the Imexus was going to come in somewhere around six figures if I can recall correctly. Plus they are built in Poland so the costs to get them state-side would add to an already higher price. No experience with one hands-on so my knowledge beyond what's available there online is pretty limited. Crikey... look at the structural stability / straightness of the sides of this thing! I sailed alongside one of these for a few days at a UK Mac Rally. Nice boat, but steering failed on him......Aside from the woodwork belowdecks, I don't see a real attraction compared to my I was with another owner as crew, and we always walked away from the Imexus. Why you walked away from the Imexus? That ist the interesting answer. But: I guess it is more roomy? I'll be glad to hold the cash of your PO while you wait. Send small, used, non-sequential, unmarked bills. 1st Sail wrote: I'm losing hope. Still waiting for an address to send my standing PO. Last edited by dlandersson on Sat Feb 09, 2019 7:23 am, edited 1 time in total. IIRC Hobbie made a 30' mono with impressive performance specs. Unfortunately the cabin height was just tall enough for a troll. Supposedly it sailed well and was well built. We are selling the company this year and moving on to full time retired. I'm sitting here with Navionics and looking at all the amazing lakes and reservoirs we want to camp and sail. I doubt if we will head to FL or the Carribean islands and we prefer the remote anchorages. North channel, lake Sakakawea, Lake Powell, Upper Miss., Lake of the Woods, etc. We would prefer to skip the small RV/Mac in exchange a larger trailer sailor. 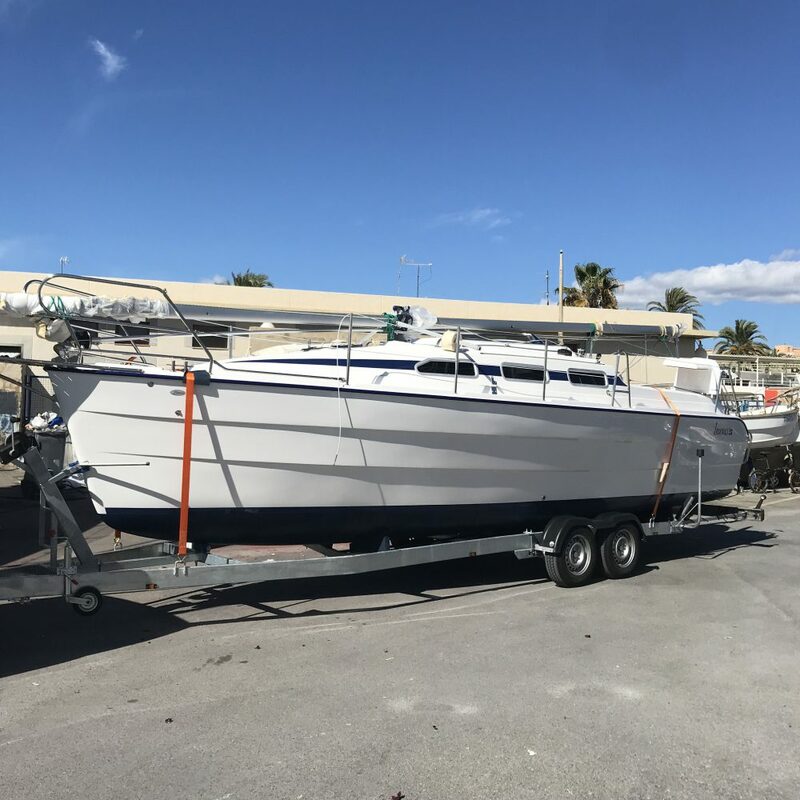 We seriously considered the Seaward 32RK but cost and having to pull permits every time we wanted to move it was too many $ and hassle to move it. For sure we still enjoy our Mac. The cost and versatility is excellent. No complaints, just want a little more room for spending several weeks cruising. Stretching a Mac would not be out of the realm of possibility. Cut the boat at the cabin ladder and add two meet to it. Have a larger cockpit.